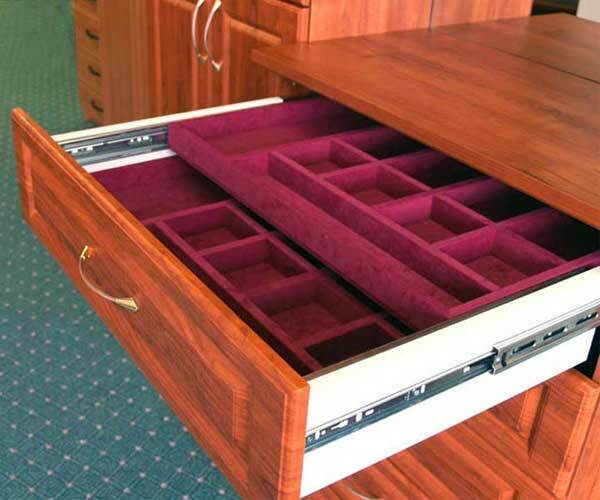 Jewelry Storage made easy by our custom made Jewelry Inserts. Our Single Jewelry Drawer Inserts and Double Jewelry Drawer Inserts and Lingerie Inserts come in two colors: Purple and Green. Built in Closet with cloth hanging, shelving for sweaters and linen, and drawer units with lingerie inserts. Get a Free In-Home Design Consultation and find out how Euro Design Center's Built in Closet designers can help you. 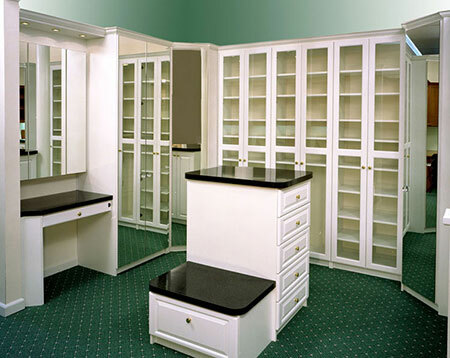 We manufacture Closet Organizers in our state of the art factory in Maryland. We install our Closet Organizers with our highly trained team of Closet installers some with over 20 years experience with our company. We offer a large selection of Closet Organizer units to satisfy your storage needs. Our installation is done by our hourly paid employees (no sub contractors), since our closet Organizers are hourly paid we have 100% control over the quality and craftsmanship and cleanliness of the job. They will not rush your job. This is one of the most important aspects of a headache free job which some may overlook. This beautiful Closet Storage System consists of a double hanging for 'his' shirts and a long hanging for 'her' dresses. 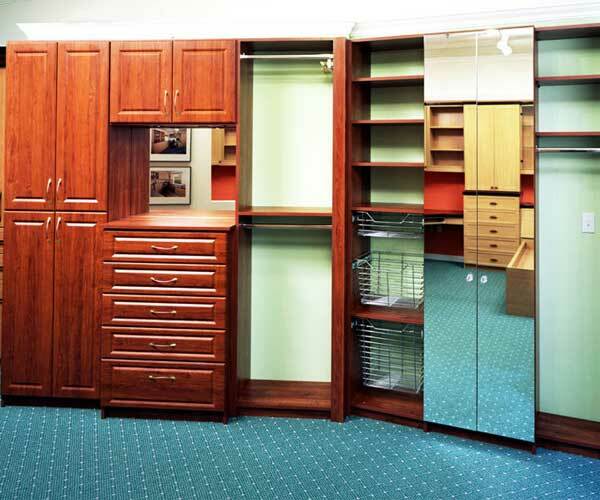 Euro Design Center fabricates and installs closet systems, walk-in closets and many different types of custom and standard closets in Maryland (MD), Virginia (VA), and Washington DC. 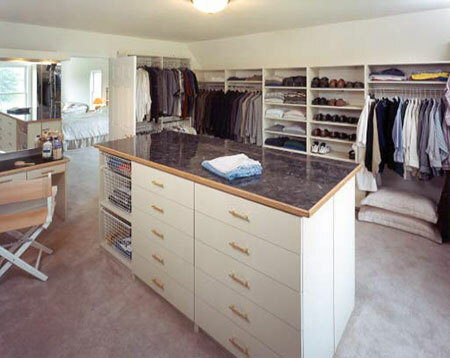 Answer all your home storage needs with Home Storage Solutions offered by Euro Closet Design. Our Home Storage Solutions are available for viewing and purchase in our Rockville and Beltsville showrooms in Maryland. We use multiple tools such as tie racks, belt racks, valet, shoe shelves, and baskets to bring you the ultimate Home Storage Solution. Ask about our jewelry inserts and double jewelry inserts to organize your jewelry. We have units with drawers that come in many different depths as a part of Euro Closet Design’s Home Storage Solutions. 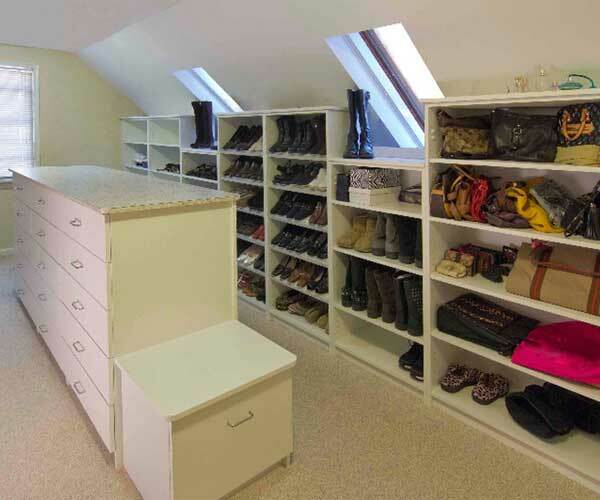 Closet Shelving serves a very important role in any Closet System. Shelving is so simple, the average customer may wonder whether a professional Closet Designer is needed to make your shelves for you. Adjustable shelves, semi-adjustable shelves, and fixed shelves all play their unique role in a Closet System. It is important that the very top shelves located above your head are Fixed shelves and not adjustable shelves for the simple reason that they can fall and injure people. 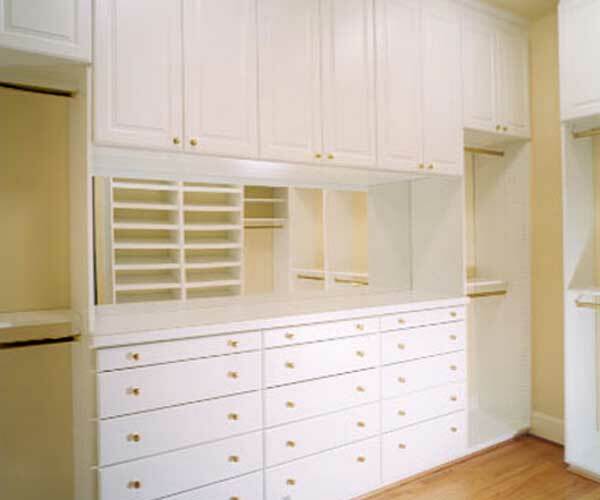 Beautiful angled wall Closet with custom doors, mirrors and baskets. This Closet is made in summer flame color. 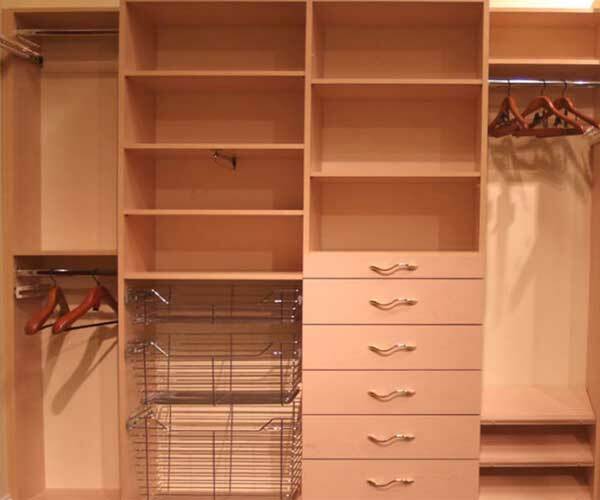 The Closet Storage system is also available in many other colors, refer to our melamine colors for Closets. With many different Closet unit configurations and various sizes Euro Design is well equipped to customize this Closet for you. 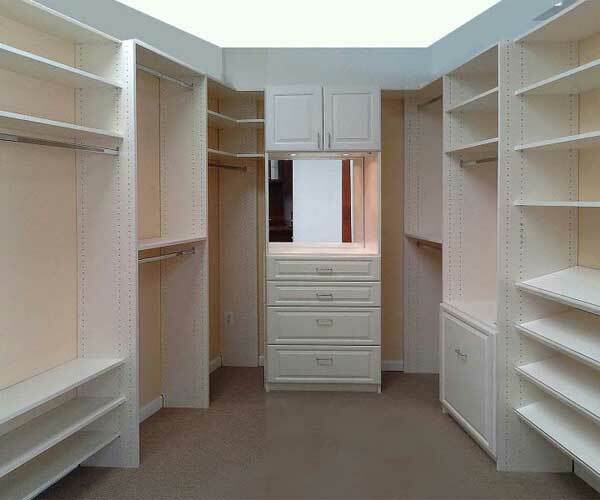 We have both custom and standard closet storage systems available. You have a larger closet than average or want to turn one of your bedrooms into a closet and want to make it look elegant and maximize the space, consider putting an island closet. Generally speaking a Closet Organization Storage solution needs to be at least 12x12. We can provide stone countertop as well as regular countertop or closet shelving on one side and drawers on the other side. Being the manufacturer not a middle man, we can design your Closet Organization Storage solution the way you want it to be. 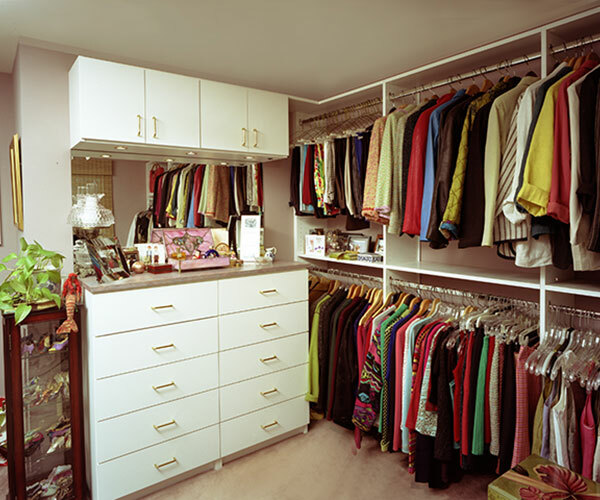 Closet Organization Systems is a key component of any organized home. Without good organization systems for your clothes, toys, books, and shoes your house can get messy very easily. Our professional designers are trained to come up with creative ideas to better utilize limited space when designing a Closet Storage System. Euro Design Center excels in Closet Design. No matter how big or small your closet maybe, we have the design solution to match your specific needs. Call us today for a Free In-Home Design Consultation.